ABOVE: A pigeon and friend in the Piazza San Marco before grain vendors were banned. 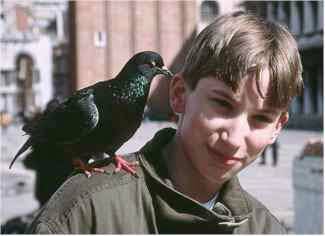 "The pigeon is, if not actually sacred, at least highly respected in Venice. You will never be offered him roasted in a Venetian restaurant. On the contrary, sometimes invalid pigeons, having lost a leg perhaps in a more than usually unseemly scramble for peanuts, become known individually to the waiters at the Piazza cafés, and are thereafter privileged for life, allowed to preen themselves on unoccupied tables, and fed wonderfully sustaining morsels of toasted sandwich. Pigeons can get away with almost anything in Venice, and sometimes you will see one, all puffed up with pride, swaggering into the narthex of the Basilica San Marco itself." "Only for a second or two did the insurance company get its money's worth: for there was just enough time to see, before the doves destroyed the pattern, that the maize had been poured on the ground in the shape of two huge letters--A.G., for Assicurazioni Generali." "According to tradition, it was from the gallery [of the Basilica] where we are standing that the original pigeons were released on Palm Sunday, weighted by pieces of paper tied to their legs. Most of them ended up on the dinner table as part of the Doge's Easter largesse to the populace, but the rugged survivors were felt to have earned St. Mark's protection. So year by year a few more pigeons found refuge among the domes on the basilica. They have since grown more numerous, and the enthusiasm of most tourists for the birds is short-lived, but as the average visitor now spends less than twenty-four hours in the city they still have plenty of friends." 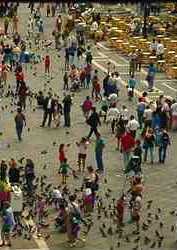 ABOVE: Tourists and pigeons in the Piazza San Marco. Today, pigeons have formed colonies throughout the city, and the estimated 100,000 birds far outnumber Venice's 60,000 human residents. 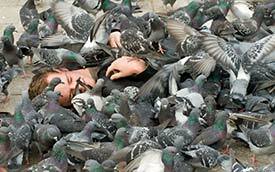 It can be disconcerting to walk down a street and encounter several dozen pigeons flying toward you at head height. They usually miss pedestrians, but not always. 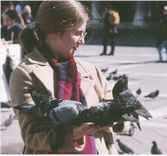 Juli Van Zyverden, an American librarian who used to live in Venice, once told me how she'd seen a pigeon collide with an elderly man who wasn't quick enough to duck. The man was bleeding, so she escorted him to a pharmacy for a clean-up and bandage. ABOVE: Could this be a scene from Alfred Hitchcock's The Birds? Many Venetians are in the habit of leaving out grain or bread for the pigeons of the neighborhood. This is illegal under a decree that the Comune di Venezia issued late in 1997.